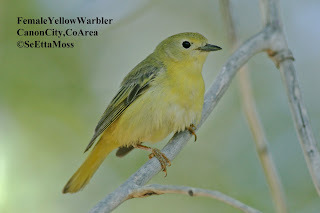 While I was looking (unsuccessfully) for the other Western Screech Owl siblings and any parent birds, the female Yellow Warbler in the top pic took great exception to my presence--she called loudly, flitted about in an agitated state and appeared to try to draw me away from her nest or fledglings which I never did see. 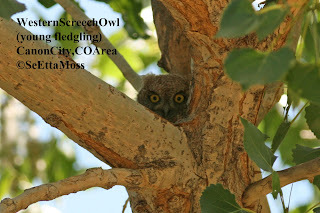 I took these pics of the young Western Screech Owl fledgling this morning with my Canon xti dslr camera (with my 400 mm lens and 1.6 multiplier for not having a full frame camera I have the equivalent of about 640 mm zoom). 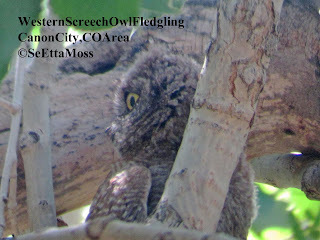 The top pic is, of course, very cute as the little owl peeks over the crook of the tree at me.